Make smooth paste of water, salt, turmeric, lemon and flour. Mix in ginger, garlic, spring onion and green chilli. Keep aside. Heat oil in a deep heavy vessel. Add seeds, asafoetida, allow to splutter. Add onions, curry leaves, coriander, mint and stirfry for 2-3 minutes. Add batter, stirring simultaneously. Stir non-stop with a large ladle till all the lumps break and boil. When boil is reached, check taste for salt, chilli etc., adjust. Cook covered loosely, on low for 6-7 minutes, stirring frequently. Add salt to flour. Add water little by little, kneading dough very well. It should become soft, pliable and smooth. 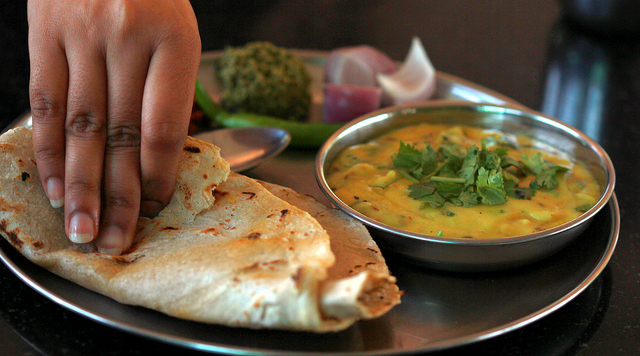 Kneading well is very important so the bhakri doesn’t break. Take a lump, dust generously with dry flour, pat with palm to flatter. Use a rotating motion to make circular. Use very little dry flour to pat. Make thin or thick as desired. Place carefully on warm griddle (tawa). Apply a little water on surface and spread evenly. When water dries, flip and roast. Put on direct flame and crisper like naan. Or semicook all and crisp as required. Top with ghee (optional) if desired. Repeat for others as desired. Serve hot with hot pithala, pickles, curds and raw chopped onions. If patting the dough is difficult, roll it using a plastic sheet underneath. If making all bhakris beforehand place loosely between two large clean cloth, to absorb excess moisture.